While Boruto is watching on, Naruto and Sasuke begin their battle against Momoshiki, who has attained further power. 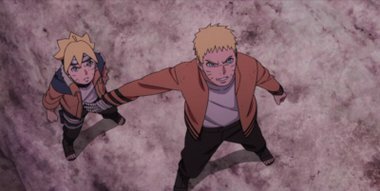 As the two heroes who defeated Kaguya who was also from the Otsutsuki clan in the past, Naruto and Sasuke demonstrate their tremendous power to overwhelm Momoshiki. However, the intrusion of an unexpected party disrupts the situation. Naruto and the others are cornered in a desperate situation. Boruto is then entrusted to enact a crucial strategy by his master, Sasuke. Il aura fallu 65 épisodes mais ça y est. J'ai enfin kiffé comme dans un bon épisode de l'époque Naruto. Meilleur épisode de Boruto jusqu'à présent !